The more I start talking to people about ingredient labels, the more they're seeing a consistent trend of produce. Lucky for our pets, fruits and vegetables are full of health benefits such as antioxidants, fiber, vitamins, minerals, cardiovascular health, immune support and aids in fighting infections. What’s not to love about that? I’ve also noticed that if we’re eating more fruits and vegetables, it’s likely that we emulate that kind of diet for our pets. When we’re health conscious personally, that plays in to the decision-making process for our pet’s diet even more. Since pets can’t speak for themselves, finding a diet rich in protein and produce is our primary role as pet parents. As you’re shopping, actively seek formulas and treats that contain fruits and vegetables (I am happy to help you out). The selection at Premium Pets is primarily USA-sourced ingredients and from world-class kitchens. When you’re selecting a treat, it’s especially important to look for options with fewer calories and something that’s easy to digest. Two of my favorite go-to treats are the Fruitables and Charlee Bears. Both options likely contain ingredients that you are already feeding your pet like apples, bananas, strawberries, sweet potatoes, carrots and even watermelon! 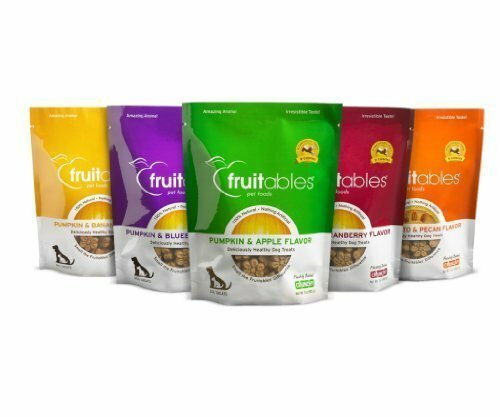 The aroma of the Fruitables is too good to pass up and the fruits make it a great treat for pets with sensitive stomachs. Charlee Bears are likewise a natural, grain-free option with less than 3 calories per treat. The pocket-size treats are great for training and are flavored with dried blueberries, cranberries and sweet potatoes for added sweetness! You can’t go wrong getting treats like these for your pets! On a side note, have you noticed how pumpkin and sweet potatoes are in almost every pet diet or treat? That’s because pumpkin and sweet potatoes are very palatable and universally a great fit for both dogs and cats. You’ll also be happy to know that pumpkin is low in calories and can be a great digestive aid as it’s full of fiber! If you have other questions or comments, please post below or visit me in the shop! I'd love to talk to you about your pet's diet! Fruits and vegetables have SO many essential functions for the pet’s body and Premium Pets has all the top choices that your pets will LOVE!